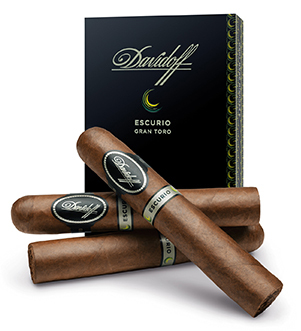 Davidoff's Escurio cigars join the blockbuster Nicaragua line under Davidoff's "Black Label" brand. Davidoff's master blenders were challenged to take inspiration from the rhythms, intrigue, and rich experiences of a night in Rio, the soul of Brazil, when developing the Escurio blend, and without question they did. Under the beautifully smooth and oily Ecuadoran Habano-seed wrapper pulse five different long filler tobaccos ~ Brazilian Mata Fina and Cubra (Cuba Brazil) and Dominican San Vicente, Piloto, and Olor/Piloto Seco ~ bound in Brazilian Cubra leaf. The superbly constructed Escurio is spicy and sweet in a very intriguing and delightful way as chili peppers dance with softer, creamy notes. Flavors of oak, liquorice, leather, and a touch of saltiness enter the picture, and then coffee notes arrive and combine to bring wonderfully complex twists and turns that culminate in a palate-captivating smoke. Rhythm, intrigue, and originality await!